The Central African Republic - the once mythical Oubangui Chari is an immense plateau at low altitude. It stretches out in the north of one of the longest rivers in Africa, the Oubangui, which forms its border with the former Zaire. A prime example of a large game hunting country, the Central African Republic is certainly one of the countries in Africa which has succeeded in conserving the authenticity of its landscapes. Almost 60% of the 623 000 km2 territory is still clear of all human damage, and shows off the exceptional biodiversity at its best. Its central position in Africa confers on it a wide range of ecosystems which go from the large equatorial forest in the south to the semi desert steppe in the north, via the shrubby savannah in the centre. The diversity of the flora and fauna, as well as the population living in this region, offers the novice or the hardened traveller the possibility to plunge into the heart of black Africa itself. One of the last regions in the world where human adventure in symbiosis with nature is still possible. With an area of 300 000 hectares, the hunting area is made up of shrubby savannah cris crossed by forest galleries (bako) all along the hydrographic network. The relief is relatively flat, with the highest point not exceeding 619 metres. 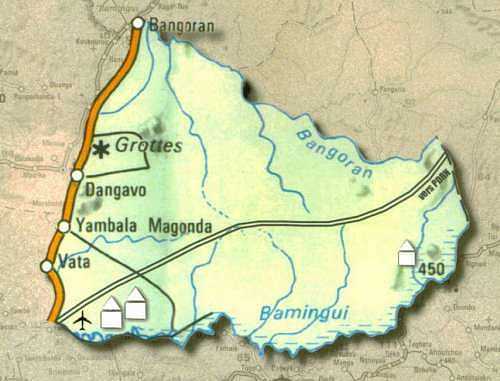 Situated in the centrenorth of the Central African Republic, its limits are as follows: the national park of Ramingui Bangoran to the west, the Bamingui river to the south, the Bangoran river to the north, and finally the Sangba and Goumbiri rivers and the 'Captain Julien' trail to the east. Whatever your centre of interest, you will have the possibility to see or to hunt the most beautiful animals in the Central African savannah: Giant Derby Eland, leopard, Nile buffalo, roan antelope, bushbuck, bush pig, warthog, but also oribi and various duikers: common, red flanked, blue. Although they are numerous, the elephants and hippopotamus are protected. In all cases, the hunting is done through tracking, except panthers which are baited. 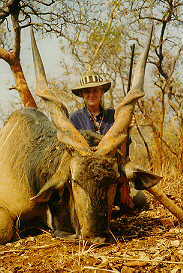 As for one of the most beautiful hunts in the world, that of the Giant Eland the largest and most majestic African antelope, these are our specialty and require hunters to be in excellent shape. Our trackers, past masters in the art of approaching this mythical animal, will guide you. If you fly from Paris with Air France, after a 6-8 hour flight you will land in Bangui and will be immediately taken care of by our hostess. You will be directed towards an aircraft for an internal flight which will take you to the base camp of Bamingui (a flight of one and a half hours). Once there, having rested and eaten, the hunting team will lead you to the hunting camp site. All trips in the region will be in a U4 6 cylinder Toyota. On your return, you will take the plane to Bangui where you can wait in a comfortable hotel until the evening-flight to Paris. The base camp in Bamingui is very close to the aeroplane runway. It is made up of permanent solid huts. This camp is a stopover: it allows us to get fresh supplies and to welcome clients who then move on to the hunting camp 80kms to the east There, you will find all modern conveniences: huts with beds and mosquito nets, fridges, freezers. The Bamingui river runs along the edge of the camp and brings a pleasant coolness to the area. One point to note is the total absence of mosquitoes, whatever the period. The lighting is provided using solar panels: in this way, the silence is respected and allows you to appreciate the sounds of the bush, from the cry of the hyenas or the roaring of lions to the croaking of frogs. Around a dozen people are at your service: cooks, kitchen boys, headwaiters, hostesses, but also skinners, gardeners and mechanics. The hunting team is made up of two trackers, a porter, a driver, an assistant guide and a professional hunting guide. We contact Bangui by radio three times a day, and also have a satellite telephone for all international communication (for a fee per minute). The cynegetic season starts on 15th December and finishes around 15th May. One point to note is that from December to February, the nights are rather cool. Even though the temperatures are higher in March, the start of the rainy season means that April is cooler. The shooting taxes include: taxes for tracking, state taxidermy and the first preparation of hunting trophies. ** For a leopard Safari, the hunter must also anticipate having to pay slaughtering tax on two dog-faced baboons for the bait. For this sort of stay, a supplement of 1525 € + the shooting taxe, will be to pay the hunter who will shoot one Roan Antelope, if the quota allows it. 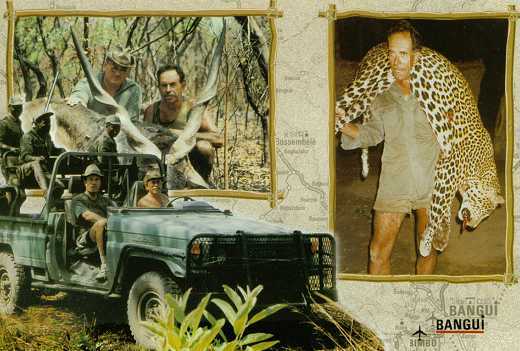 The organisation of the safari from the base-camp, use of the vehicle, the services of the hunting team and of a professional guide, meals and drinks (personal drinks on request and depending on availability in the country). No person is obliged to accept the supplements which we offer, and each person has the right to organise his journey as he wishes. However, our supplements have the advantage of protecting the tourist from frequent and unpleasant last-minute costs. Fixed price of 305-762 Euros per box of trophies, including packaging and transport as far as Bangui, as well as the certificate of origin, the tax per trophy (5 euros each), export tax (CITES), customs tax and breeding, the administration required for sending trophies. A safari is definitely booked upon payment of 50% of the amount due. The balance of 50% is payable 45 days before departure. A safari can not begin if the total amount due has not been received. A cancellation more than 90 days before the provisionary date for the safari entails reimbursement of all payments made minus 20% ; a cancellation less than 90 days before does not justify any reimbursement, but the withdrawing hunter may be replaced by the person of his choice. You may also decide to take out an insurance policy against cancellation. We do not accept cheques for the slaughtering taxes, tips and/or personal expenses. Please be kind enough to ensure you have travellers cheques or money in cash, in euros or in Central African Republic francs. The safaris of CENTRAFRIQUE SAFARI can not be held responsible for any delays or lost luggage under AIR FRANCE or other airlines, nor for any delay suffered through the central African charter companies. A complete list of this year's hunters with their results is available as references.